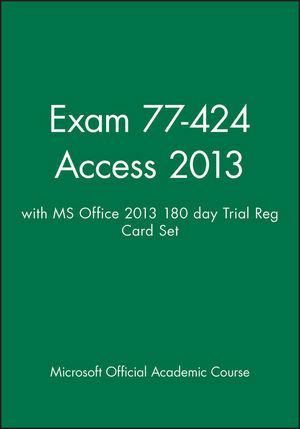 This Microsoft Access 2013, Exam 77-424 is the only Microsoft Official Academic Course (MOAC) textbook. This series includes a complete classroom instructional program. This Access 2013 text is mapped to the Access 2013 certification exam objectives and is designed to re-enforce workforce skills. With this book students learn to create and manage a database, build tables and forms, create and manage queries, design reports and much more. 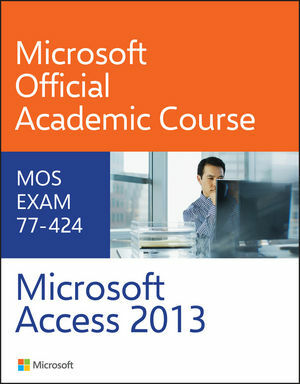 The Microsoft Official Academic Course (MOAC) Office series also offers OfficeGrader. This valuable tool corrects your students’ tasked-based assignments. Students work on real-world problems like the ones they will encounter in the workforce ensuring they are ready for real professional challenges. OfficeGrader allows for efficient and consistent grading saving time for other important teaching activities. Grading is easier than ever allowing faster assignment turnaround to students. Access 2013 certification can help students with classwork and differentiate job hunters in today’s competitive job market. Students who have earned certification can broaden their employment opportunities in such fields as a support professional, trainer, teacher, professor, database user, or database creator who needs to create or maintain a basic Access database. Students will also understand how to construct and modify basic relationships among database entities and instruct others in basic Access functionality and usage.